If we've learned anything from the current financial crisis, we've learned that it's important to understand what it is we're actually investing in. No more black-box investing, right? That's true of the folks on Wall Street, but it's also true of the average mutual-fund investor, too. If you invest in mutual funds and you want to understand what you are about to buy, you'll have to thumb through the prospectus and Statement of Additional Information. These two documents tell you what the fund managers intend to do with your money — and how much they're going to charge you for doing it. Unfortunately, this information is usually drowned in a soup of legalese, but the information is there, and I'm going to show you how to find what you need in less than 10 minutes. You've probably heard the term prospectus, but you may have never heard about the Statement of Additional Information (SAI). The SAI is where the fund's lawyers put all the information they want to hide from the avid prospectus-reading public. When you first think about actually reading a prospectus and SAI, you might be frightened. Buck up. We're going to get through this together. There are really only a handful of items you need to be concerned with. What can the fund managers do with your money? Let's consult the prospectus first. Go to your mutual fund's website and download the fund prospectus and while you're at it, get the Statement of Additional Information. For an example of a prospectus and SAI, take a look at those from the Vanguard Capital Value Fund. If you turn to the Table of Contents (in the prospectus) you'll probably see a section that talks about Risk/Return. Each fund family uses different headings for the sections so you'll just have to look around a little. If you don't see a section heading for “Risk/Return”, glance through the first several pages. You should see a discussion about Investment Objectives, Primary Strategies, and Primary Risks. I downloaded the prospectus of a very popular large-cap growth fund (not the one linked above) and turned to the risk section. Each Fund may invest up to 15% of its net assets in illiquid investments (i.e., securities that are not readily marketable). This particular SAI also pointed out that the fund may put up to 20% of its assets into High-Yield-Risk Bonds, it may invest in futures contacts, and may invest in other mutual funds. I also found that the fund can sell securities short. When you read the section in the prospectus about risk/reward and the section in the SAI about Investment Policies and Restrictions, you may not be familiar with all of the terms. High-yield bonds? Futures? Selling short? What's all that? Rather than enroll in the nearest MBA program you can find, I would approach it as follows. Once you understand what the company does with your money, make sure it's consistent with your ultimate goals. For example, let's say you want to buy a fund that invests in large, well-established companies. You've done your homework and you are comfortable with the risks of doing that. If you read the prospectus and it mentions that the fund can also invest in other areas, you may want to pass. Why? Because it may be investing in areas that have much greater risk than you are comfortable taking. What are the fund's investment returns? In most cases, the information about investment returns is straightforward and easy to understand. Here's a peek at the returns section from the prospectus I downloaded. First look at the “Returns Before Taxes” and compare the numbers to the Russell 1000 and S&P 500 Index numbers. Compare the before tax numbers because the indexes are also all before tax. 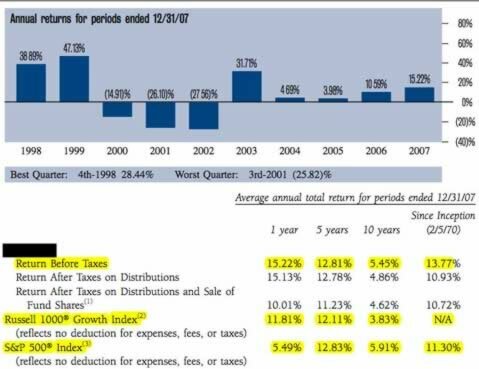 You can see that this fund out-performed the indexes in 1-, 5-, and 10-year periods and also since inception. That's encouraging. The question is whether or not the fund is being compared to the correct index. You'll get a feel for that by reading the “Fund Profile” in the prospectus. For example, if you are considering investing in a fund that buys shares in small cap international companies, the prospectus shouldn't compare its performance to the S&P 500. While these 1-, 5-, and 10-year averages are helpful, the yearly numbers are more important. You see that information in the blue graph. This tells you how the fund did in each of the last several years. You can see how the fund did in good and bad years. 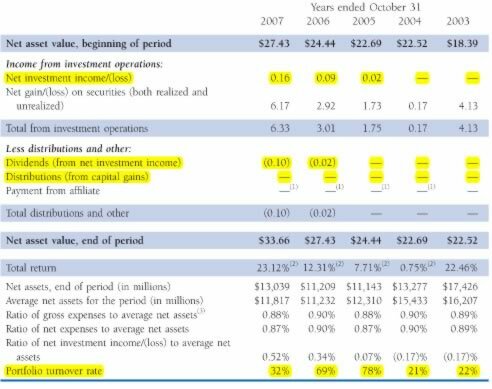 For example, in 2002 the fund lost 27% and in 2003 it was up 31%. Is that volatility in line with your appetite for risk? If not, look for a different fund. Conclusion? Read the Risk/Return section of the prospectus and the Investment Policies and Restrictions in the SAI. Again, the fund families use different topic headings but with a little common sense, you'll pinpoint this information. This will tell you what the fund can and can not do with your money. It will also tell you how they performed. Once you review this, you might find that your fund leaves you with a bad taste in your mouth. What are the fees and expenses? Shareholder fees consist of loads, exchange fees, and redemption fees. If you are clever enough to read Get Rich Slowly, you are also too smart to buy loaded funds. This particular fund has no upfront loads but does charge you 2% if you sell it within 90 days. So don't buy this fund unless you are sure you'll hold on to it at least that long. Don't get too cozy yet. Every mutual fund investor in the galaxy is still subject to a second class of fees. These are fund expenses, which are paid out of the funds' assets — even if the fund loses money. You don't get a bill for these expenses, but the costs are taken out of the fund and it reduces the value of your account each year. Watch fees carefully because they can be a huge ripoff. All you really care about is the percentage number under Net Annual Fund Operating Expenses. In this example the total is 0.88%. If you invest $10,000, the fund will charge you $88 per year. Not too bad — so far. But if you go back to the Table of Contents in the Prospectus and look up a section titled Management of the Funds, you might find a section called “Investment Adviser and Management Expenses”. This is important because the fund might hide some of their fees there. In the prospectus I reviewed, I found a performance bonus that was not disclosed elsewhere. This performance bonus basically rewards the fund manager if he or she outperforms its benchmark. In this particular case, if the fund manager does earn the bonus, it can boost total expenses from 0.88% to 0.95%. That may not be a lot of money, but from where I'm sitting, I don't want to be told the expenses are 0.88% when in fact they could be 0.95%. Look at the Distributions section. This tells how much taxable interest and capital gains were distributed in the past. Big numbers here mean higher taxes for you. Beware. But by far one of the highest costs that investors usually overlook is the turnover cost. Turnover is basically the number of times the entire portfolio is bought and sold. Generally, the higher the turnover the greater the cost. Why is turnover so expensive? First, it creates commission expenses. But it also results in higher prices when the fund buys stocks and lower prices received when securities are sold. Why? Let's look at an example. When you or I sell our measly 100 shares of Apple, the price of the stock doesn't budge. But what happens when our mega-fund sells 10 zillion shares of Apple? They can't sell all the shares at once. If they do, the price will tank. No, they buy or sell shares slowly, and even then the purchase or sale of so many shares impacts the price of the shares. So the more often the funds buy or sell, the more often you are impacted by this movement in price. It's called “slippage” and believe me, when you slip and fall on this baby, it hurts. That's a 44% increase in total disclosed costs! Are their potential conflicts of interest? There's one more piece of information I'd like you to consider. Look for investments your fund makes in brokerage companies. Look for a section that is called “Portfolio Transactions and Brokerage”. In this case, our fund had almost $700 million invested in the shares of brokerage firms it uses. This is important because it raises the issue of impartiality. The fund's one and only job is to make money for you and me. So is it buying shares of those brokerage firms to help you and the other investors make money? I don't know. Maybe the fund buys those brokerage shares to pressure them into selling more of the fund. That would certainly help the owners of the fund but it may really hurt you and me. It reminds me of going to a doctor who owns lots of shares in a particular pharmaceutical company and the doctor keeps prescribing meds from that pharmaceutical firm. Is the medication to help me — or the doctor? Not all prospectuses are dark and evil. For example, I've found that Vanguard prospectuses were written in plain English and easy to understand. They also have about half the pages that many other prospectuses have. There are probably other fund families that offer easy-to-read documentation, but I came away with the sense that the thicker the prospectus, the more the fund family had to hide. Have you ever taken the plunge and actually read the prospectus? Were you surprised by what you found? Are you going to pick up the gauntlet and read those beasts next time they find their way to your mailbox? Neal Frankle is a Certified Financial Planner, and the author of Wealth Pilgrim, a blog about his financial journey. There are 28 reader responses to "How to Read a Mutual Fund Prospectus". Seems like a no-brainer to throw that in there. Time and time again I find that people continue to invest in managed funds and/or use financial advisors that have much different motives than you and I. As you stated, fees, loading and churn are always over-looked and in the short-term look to be ‘no big deal’. However, over time these can become large sums of money as retirement savings happens for 40 years. Do you think this is simply another case of media twisting the consumers arm? Everyday I see something in newspapers about mutual funds. And every month there are magazines littered with titles such as “top 10 mutual funds for 2009”. If they are such a bad deal – why doesn’t anyone say it!? WC – why would he mention about past returns? That’s a disclaimer that the mutual fund companies use. I don’t read prospectus’ but I also don’t buy actively managed mutual funds – if you do then I agree with Neal that you should try to figure out what they invest in. One of my complaints about most funds is that they have a lot of leeway in what they invest in and they don’t report their holdings until well after the fact so even if you read the prospectus you can’t be sure of what you own. I like plain vanilla index funds and etfs because it is much more clear what they own. This was really helpful, thanks. I’ve struggled in the past with getting through a prospectus, but feel better prepared now. Back in 1995, my wife bought a mutual fund touted as “prime plus” from an investment arm of Union Bank. To make a long story short, it never returned “prime plus” or even “prime” for that matter. She could have done equally as well in a CD. She finally sold it a couple of years ago, before it tanked “big time”. For what it’s worth, you probably don’t need to be quite as suspicious as this post suggests. By and large the strategies outlined in the prospectus are binding, and the exceptions are limited. So even though a fund may reserve the right to put 15% of its funds in crazytown, it would be hard to mesh a long-term investment in crazytown with an avowed strategy of, say, only government bonds, and the fund manager has lawyers who will tell him that. By and large the significant leeway fund managers reserve for themselves is only used in extraordinary situations, and the description of what they plan to do with your money is what they will do with your money. The fact that they’re allowed to do some of the things they’re allowed to do should raise your eyebrows and you should investigate further, but the mere fact that a fund can invest in futures as a hedging strategy doesn’t mean they’ll be cowboying the options market like Slim Pickens. To be quite honest, I agree with Steve. Maybe if the article started with, “why you should actually bother doing this” I would have read the whole thing and not just the bolded parts. I’m not sure that reading these things does you any good, people seem to just read them on principle. I’ve never heard of someone deciding *not* to do something after reading the contract — such as for a mortgage, a cell phone contract, or the end-user license agreement for software. This is similar. You’re going to read it, and at the end you’re going to say “ok, seems fine”, just like you’ve done with every single other contract you’ve ever signed in your life. When I was 19 and wanted to start investing, my family’s insurance agent suggested I invest in one of the mutual funds her company offers (of course). I’m still in the fund as it has performed well for me over the past few years, but it has a high expense ratio and is a loaded fund to boot. As I don’t need the money in there for a while, I plan on continuing to buy shares for maybe the rest of the year, stop, and then wait for all of my shares to get past the CDSC period. I’m lucky that the fund performs well compared to other funds in the family, but I wish I’d known then what I do now. Then again, the same agent sold my parents on the idea that I needed life insurance at that young age, and I still have that policy though I don’t have any dependents. Gah. Thanks for this! If nothing else, I learned what a loaded fund is and now feel like a sucker (damnit). Anyways, I now know how to interpret fees and expenses. I guess my loaded funds have really low fees/expenses and so I will stick with them. But any future investments will probably be put elsewhere and I will find a fee-based financial advisor. Thank you, J.D. Thank you, Neal. This is incredibly useful. I think this is great and useful, even for an index fund investor because not all index funds are created equal. Also, once you flip through a few prospectuses, you will become familiar enough with the layout and content to quickly find what you need as you look at others in the future. This is a good skill to have. I’m amazed how some people will spend so much time figuring out which digital camera to buy, even downloading and reading operating manuals before hand. Yet, others will spend much more money a mutual fund that got mentioned in a magazine, at a family gathering, or by a broker without reading even the prospectus!?! We are a microwave society that wants bite sized information that we can digest quickly. A prospectus requires entirely too much time to read and understand. Why else to you think the CAPS and morning star ratings are so popular? 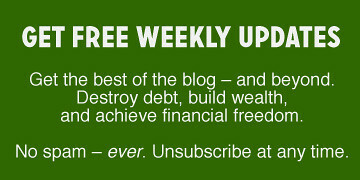 I’d just like to point out that “(As an added bonus, if you follow this rule, you’ll never be a victim of a Ponzi scheme. )” is not necessarily true. A criminal can put whatever claims they like into the prospectus, and not bother following it. I’m sure Bernie Madoff’s prospectuses looked too good to be true. But I will agree with Neal that if there’s anything in those disclosure documents that makes you feel uncomfortable, or you disagree with, find another fund to invest with. Thanks for all these thoughtful comments. Sorry I couldn’t respond earlier. 1. For many different reasons, I feel that the media twists in favor of the funds. Why? Because they are huge advertisers. 2. Oblivious – great question. The answer requires another post. Up to JD! 3. ABC answered Colin’s question better than I could. 4. Will…thanks. I agree with your comments entirely. 6.Bozo….glad you got out while you could. 7. Chase, I used the term that was used in the prospectus to make it easier on the reader but thanks…I should have mentioned that. 8. Jones…you are 100% right in 90% of the cases and I should have pointed that out. The problem is that you never know when your fund is in that 10%. Better safe than sorry….right? 9. Tyler….thanks. That’s a good reminder. I will try to do that next time. 10. KC – good for you. Glad the fund is working for you but it might be time to get a different agent! 11. Nick, Dylan and Kad, glad it was of use to you and thank you for taking the time to share your kind words. 12. Chet – I understand your frustration and at the same time, I think its time we took the time. Spend the 10 minutes on reading the prospectus. It might save you a lot. ABCs: there’s a reason that mutual funds put that language in there–to cover their a**es. I thought it would just be good practice to tell people that, yeah, looking at past results is one thing to look at, but don’t read too much into it. I’ve read so many articles showing statistics about how mutual fund performance can be “steady” for 3-4 years and then fall off the face of the earth. What a fabulous post. Well-written and informative. Why anyone invests in actively-managed mutual funds is beyond me, especially when one considers the hidden costs like turnover. Thanks, Neal. True, Madoff operated in the murky, pirate-infested waters of hedge funds, which are not subject to nearly the amount of regulation that the rest of the financial industry is. The major issue with him is that the watchdogs didn’t bark because they knew Madoff, and he was “a great guy”. His charisma was enough to get people to foolishly invest their money with him. Sharon….agreed and its a source of real frustration. I happen to know that many small RIA firms get the full blown audit by the SEC lasting weeks while this bum gets a pass. The SEC regulators who shirked their responsibility should go to jail. Mutual funds offer great diversification opportunities, but you should know what you are getting into . . .
A mutual fund prospectus is like a company annual report. They will both give you the most reliable information about a particular investment in a fund or company. I use the words “most reliable information” in the relative sense rather than in the absolute sense. Even though it is the most reliable information that doesn’t mean that it is accurate! But unfortunately, very few would-be investors read either type of document (including the appendices and notes and statements of additional information) before investing in the fund or company. Prospectus and Annual Report documents generally have vast amounts of information about how the fund / company work that you will never find anywhere else. And about how the rules of the game might change in the future for the fund or company. Just make sure that if you click on the “3 ETFs Ready To Surge” Google Adsense link on this page to get the free report, that you apply Neal Frankle’s rules to your review of the report! I have blindly invested with a financial Advisor (sales person) at a large firm. After watching my $$ quickly erode I had decided to just “get out” but am not sure where to go. I am a newbie and am interested in this mysterious investing game and am cramming to learn as much and as quickly as possible, but guys, investing is extremely complex. I’m not greedy; just don’t want to be poor when I retire. Now my Advisor wants to place my $$ in ETFs instead of mutual funds. He is begging me to not leave him…. maybe I should…. maybe I shouldn’t. What would you do? Allow him to continue and only invest in ETF’s for me or leave? I have put off seeing him, because I have not found the questions to ask him regarding his new suggestion? Advise? Pretty please? I’ve recently found something strange. A prospectus for a mutual fund that I received has VERY different 1yr., 3 yr. and 5 yr. returns than the Morningstar report for the same fund. (For one year, it’s the difference between a 23% loss and a 14% gain.) Like a lot of your readers, I’ve never looked closely at the prospectus before. But now I don’t know which one to believe. My investment advisor seems to believe the Morningstar, but being a lawyer, I’m inclined to trust the prospectus. Remember, all prospectuses can lie. If Charles Ponzi had issued a prospectus (did they have prospecti back then?) it would’ve been about postage slip arbitrage, which is an incredibly simple concept to understand, and not a bad one, on the face of it. His namesake scheme was to compensate for the fact that his investment strategy wasn’t actually working that well. Also, re:load funds…most of load funds’ shares are sold without loads these days (institutional- or advisor-class shares, or R-class shares for 401(k)s). So people investing in load funds in their 401(k) often are getting a load fund sans load, and if you can get advisor-class shares, you often don’t have 12b-1 charges, either…though the expense ratio will still usually be pretty high. Does anyone know the percentage of folks that actually take the time to read a prospectus?